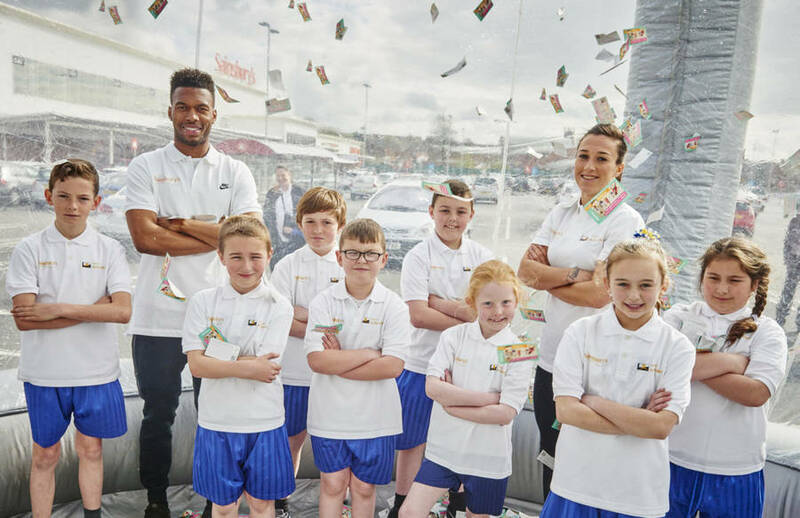 England international footballers Daniel Sturridge and Lucy Bronze went head to head at a Sainsbury’s store in Merseyside on 29th April where they took part in a unique contest to encourage families to submit their Active Kids vouchers into schools and clubs ahead of the redemption deadline on 12th July. Based on iconic TV show The Crystal Maze, Daniel and Lucy kicked off the activity at the Rice Lane store, where they were joined by children from Gwladys Street Community School, to mark the upcoming Active Kids voucher collection deadline. With the clock ticking, the two footballers showed off their sporting skills for 25 minutes in the football-shaped dome, collecting as many vouchers as they possibly could ahead of the final whistle. Supported by their mini-teammates, Daniel and Lucy managed to collect a total of 1,500 vouchers to be donated to the school. Daniel Sturridge and Lucy Bronze are ambassadors for Sainsbury’s Active Kids, alongside Team GB Paralympic heroes Ellie Simmonds and Jonnie Peacock. Both players are urging families to submit their Active Kids vouchers to their respective schools and clubs for them to redeem against sports and cooking equipment ahead of the deadline on 12th July. Vouchers donated to schools or community clubs can be exchanged for a wide range of sports and cooking equipment to help motivate and encourage children to lead healthier and more active lives. Since 2005, Sainsbury’s has provided over £160 million worth of equipment and experiences. This equipment allows children the opportunity to participate in activities such as cooking, martial arts and dance, encouraging them to lead healthier and more active lives from a young age.